The Balmorran Arms corporation has been one of Balmorra's largest and most influential manufacturers of weapons, military equipment and droids for over a century. Its products cemented Balmorra's reputation as a producer of high-quality technology, and shortly before the Imperial invasion, the company built a new factory headquarters--at the time, declared the most state-of-the-art arms production and research facility in the galaxy. When the Empire invaded, however, the Balmorran Arms Factory found a different purpose. 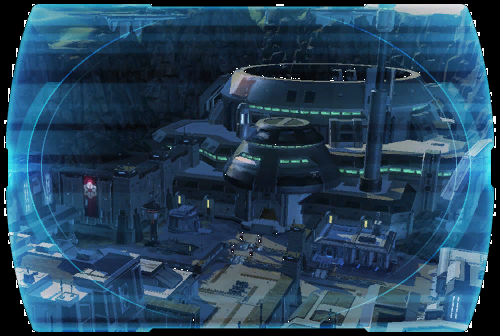 The compound's massive walls and production facilities became the core of the Balmorran resistance effort, giving Republic troops and Balmorran soldiers an impenetrable fortress with a nearly endless supply of resources and weaponry. In the years since, the factory has been under constant siege, but has never fallen. Rumor has it that the resistance has even taken advantage of the factory's research facilities, developing devastating new technology to drive the Empire off Balmorra. Bugtown represents the deadly, shattered remnants of Balmorran technological pride--ground zero for the planet's Colicoid infestation. Known originally as Lab 352, the genetic research facility came to be known as Bugtown when the Empire invaded. One of the Empire's many acts of sabotage involved releasing the results of Lab 352's biological experiments: the vicious, mutated Colicoids. The insects quickly overran the area, killing the facility's staff. Since the initial invasion, the Colicoids have gradually spread from the Bugtown ruins out across the planet. Why the Balmorrans were mutating Colicoids is unknown--everyone behind the experiments seemingly died when the creatures were set free. Still, if answers are to be found, they will be found in Bugtown's databanks. One of many small, unnamed factory towns on Balmorra, the place now known as Ghost Town was the site of experimental industrial farming operations meant to produce man-made, dense, nutrient-rich plants capable of feeding hundreds with only a small quantity. Ghost Town saw all its inhabitants massacred during the Imperial invasion. Since then, the resistance has crept into the area, using the abandoned buildings to launch guerrilla attacks on Imperial forces and a nearby cave system as a base for anti-aircraft assaults on Imperial squadrons. The small gardens have also been brought back into operation, supplying food for the resistance. Prior to the Imperial invasion, Balmorra was one of the galaxy's foremost producers of military droids, due in no small part to the Okara Droid Company. When the Empire invaded, its technicians uploaded a virus to the company's manufacturing center--the massive, automated Okara Droid factory--in hopes of turning the factory against the Balmorrans. The virus worked too well, and the factory's defense droids and systems took over entirely, resuming production operations and attacking any and all life that came near. The Empire is currently making efforts to bring the factory under control, but so far has had little success. Named for the old Traken-4 ChemWorks, Outpost Traken-4 is now held by the Balmorran resistance. The ChemWorks were destroyed in the Imperial bombardment of Balmorra, and the entire area surrounding the outpost is covered in pools of deadly chemical waste. The toxic pools have been a boon to resistance defenders at the outpost--the choke points leading around the pools are well defended, making a large-scale assault impossible. Resistance fighters stationed at the outpost must rotate to other locations on Balmorra frequently, however: the long-term effects of exposure to the chemical waste are unknown. Built into one of the craters created by the Imperial bombardment, Outpost Victory began as a small outpost of resistance fighters. Over the years, however, it has grown into one of the resistance's major outposts, guarded by enormous anti-aircraft guns and shields to defend against orbital strikes. Imperial prisoners captured by the resistance are often held in Outpost Victory, and lately there have been unconfirmed rumors of a Republic presence at the outpost. Sobrik was the original capital of Balmorra before the more advantageous location of Bin Prime was chosen to replace it three hundred years ago. Since then, the city of Sobrik has first shrunk, then been almost entirely obliterated by bombing runs and rebuilt by Imperial engineers. Sobrik was one of the last cities to hold out during the Imperial invasion of the planet; because of this and its close proximity to the state-of-the-art Balmorran Arms and Okara Droid factories, the Empire has made Sobrik the headquarters of its occupation, maintaining tight control over the remaining civilian population. The Troida Military Workshop epitomizes the "new" Balmorra. Ostensibly an independent business, it nonetheless answers to the Empire and serves as a supply depot and weapons manufacturer for Imperial headquarters in Sobrik. Its overseers are expected to worry about Imperial edicts first, and profit last. Not surprisingly, its workers have been known in the past to harbor resistance sympathies. Nevertheless, its production remains strategically vital to the Imperial war effort, and caravans between Sobrik and Troida have been subjected to frequent guerrilla attacks by the resistance in an attempt to cut off the lifeblood of the Empire on Balmorra. Once an independent corporate and manufacturing world, Balmorra was defended by the Republic and conquered by the Empire during the war. Now the corporations have mostly fled, local collaborators have been rewarded with positions in the Imperial puppet government, and an entrenched and well-armed resistance opposes the Empire's rule. Despite brutal retaliation by the Imperial military against military and civilian targets, the battle to eliminate the resistance drags on. Droid factories and industrial waste sites have become battlegrounds. The main Balmorran spaceport is in the city of Sobrik, an Imperial military stronghold heavily fortified against resistance attacks.